Once the faculty input process has been initiated, faculty members can start updating their activities. In addition, system administrators can monitor faculty input participation and start approving faculty activities. If the activity input for a faculty member is approved at one level but rejected at the next level, the review process has to start over from the beginning. The faculty member will receive an e-mail notification regarding the rejection, along with instructions on what the faculty member needs to do (such as update their activities) to have their faculty input approved. A notification message will also display in the To Do section on the dashboard. From the Admin section of the Navigationmenu, click Administration. Click Approve Faculty Input in the Activity Input section. The Approval Process screen displays. In the General section, specify the start date, end date, and the desired workflow form. In the Faculty section, select the faculty members to be included in the approval process. Click Build Report. 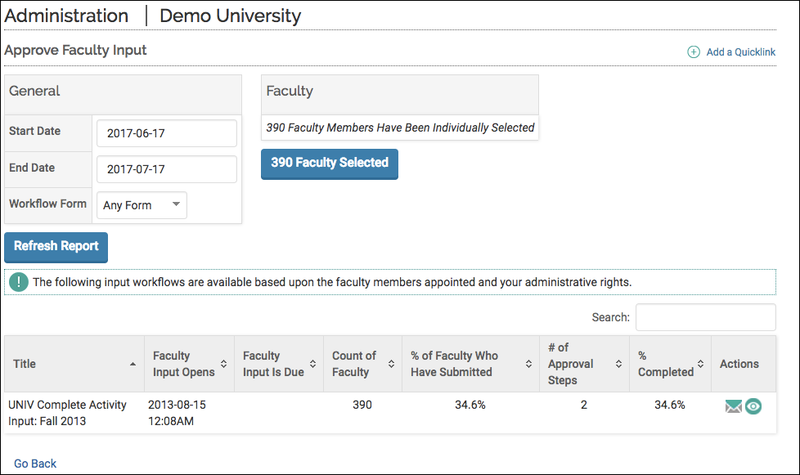 A report displays, showing the percentage of faculty members who have submitted and completed their activity input form. The number of approval levels that were created for each workflow also displays. Click the View icon in the Actions column to view the approval process. A list of all faculty members included in the selected approval process displays. To view and approve/reject the activity input for a faculty member, click the View icon in the View and Approve column. You then have the option of approving or rejecting faculty member's activities.